Manufacturer & Exporter of Saree Embroideries. Our product range also comprises of Lehenga & Gown Embroidery Work, Embroidered T-Shirt and Swarovski Embroidery. We offer our customers with an exclusive and intricate range of Hand Embroidered Beaded And Thread Work Saree to our clients. 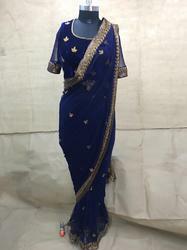 The stitching with good finishing and intricate embroidery works and the finest material will be used in saree are done as per latest fashion trends. The back of the blouse also have fine resham work with nice caps and with a contrast color of net. Our offered cutdana beaded saree Works are available at industry competitive price. We can made for you all colors as you require. Features: Composite fabric neavy blue colors and patterns Shrink resistance.